I got invited to a Champagne and caviar pairing dinner. I'm trying to cut back on winemaker dinners -- hard to maintain my girlish figure -- but come on, Champagne and caviar? I went; wouldn't you? The idea for the Taittinger Champagne folks was to show writers that, for whatever kind of caviar you might decide to indulge in, there's a fine Champagne pairing. Most of the other writers were food people, with a travel writer or two. We learned a lot about caviar. 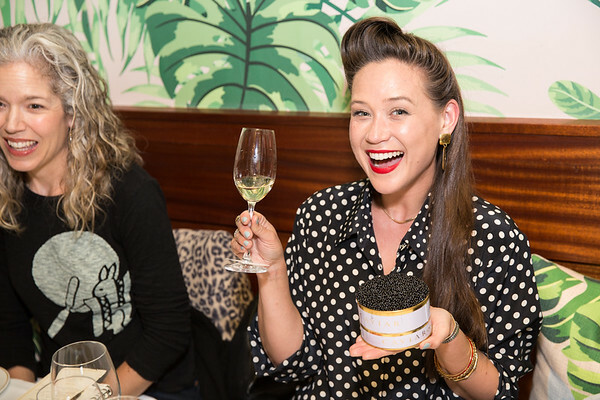 I also learned something important about food and wine pairing that, like Dorothy in the Wizard of Oz, I guess I already knew, but let's talk about caviar first. Best wine of the night. Order it here. The caviar is best at the front of the egg sac, and gets progressively fattier toward the back of the egg sac. The salt content is about 3.4% throughout the sac, but the more expensive caviar at the front tastes saltier because it has less fat. Osetra Royal, the priciest roe from Calvisius Caviar at $120 to $180 per ounce, comes from the front 10% of the egg sac. It's really good: rich yet only moderately salty, with a terrific long finish. I like the potent fishiness of Siberian caviar ($65 to $70 per ounce), but Osetra Royal is more elegant. Russia, said John Knierim from Calvisius Caviar, actually has very little caviar left after years of overfishing. (Maybe this is why they're after our political system: to get our fish.) "Siberian" caviar is now a stylistic description like (heavy sigh) Maryland blue crabs. His company's caviar comes from Italy. Knierim did not want to tell me how much money's worth of caviar I ate, and I really wanted to know. We got tiny little spoons with no seconds: about 3 grams of each, he finally said. Thus a little spoonful of Osetra Royal cost between $20 to $36, which puts it in perspective: it's the price of an entire entree while weighing about as much as the sauce I wipe off my mouth. The small size of the portions made testing the pairings challenging, but I did my best. Everyone else ate the caviar they were given with the Champagne they were told it goes best with, and pronounced the pairings excellent. Me, I ate minute mini-dollops of fish roe, like I could see the individual eggs, so I could try the caviars with more than one Champagne. We were given Taittinger Prélude Grands Cru Champagne NV with Osetra Classic caviar, the third-highest grade. 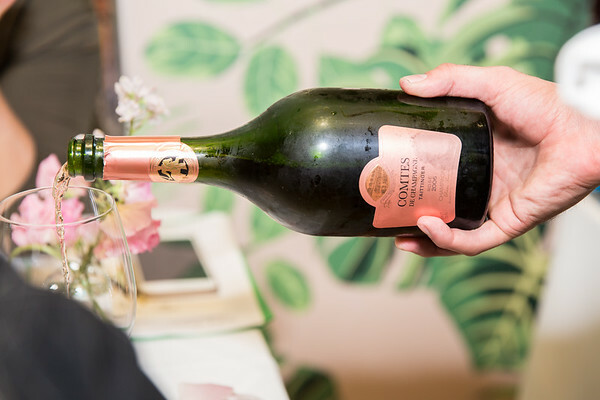 The entry-level Champagne is nutty, soft and sweet on the finish; it works with the saltier entry-level caviars because of its sweetness. With the most expensive Osetra Royal caviar we got Taittinger Comtes de Champagne Rosé 2006, which is terrific: smoked strawberry character, dry and elegant. I love it with the Osetra Royal. I also love it with the Siberian caviar; it seems to let the flavor of the caviar linger. Then I realize something really basic: I prefer the Champagnes I like best, regardless of the caviar. The caviars vary a lot, and the Champagnes vary a lot, but I still most like the wine I most like. There's a lesson in that, and I only had to endure a caviar and Champagne dinner to learn it. (I say endure because, look at that photo. Most of the writers were just having a great old time, and why not? We got free Champagne and caviar! Me, I'm clearly looking to blow the lid off this whole Champagne and caviar conspiracy. excellent post. insightful, funny and brief. not a combo you see much on the internet. Thanks! I only bust out the white glasses for special occasions. 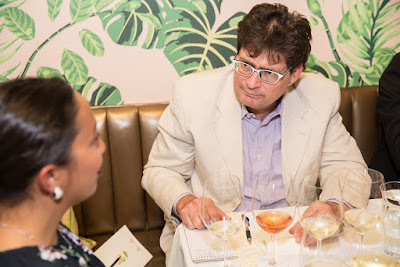 "This is how normal people look when they're attending a free Champagne and caviar dinner. See how I look below" - Jesus Christ, Blake! Have your photo taken after you've had some Champagne. "Then I realize something really basic: I prefer the Champagnes I like best, regardless of the caviar." "Perhaps more than 30 years ago, during lunch with the late Louis M. Martini, that dynamic, Italian-born California wine master uttered a memorable sentence that still sticks in my mind: 'We like that best to which we are accustomed.'"